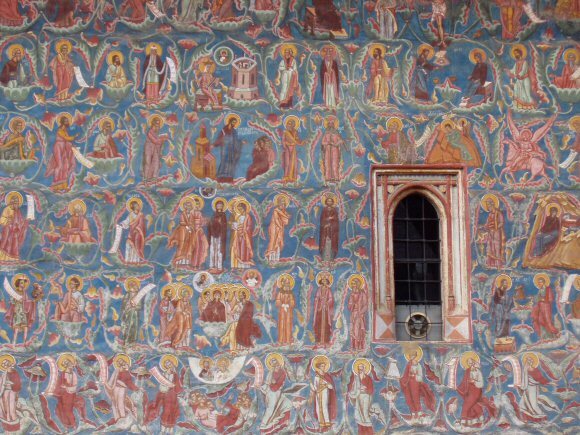 My photograph for 2005 was of a wall of one of Romania's painted churches. It is the church in the centre of the monastery at Moldoviţa (transcribed "Moldovitsa" in ASCII & pronounced "Moldoveetsa" in English) in Bucovina. I liked the way the window made a break in the fresco and showed that it was an outside wall and the the way the modern ventilator in the window dragged the historic picture into the contemporary world. I took the photograph whilst on a dance tour in Romania in 2005. The painted churches are a distinctive historic feature there. Many churches in Eastern Europe are painted with saints & other religious images inside but these are also painted on the outside. The frescos are protected by the church roofs having substantial overhangs. Another tradition of churches in the area is them to be in a fortified walled compound but that was for a practical reason: to keep out raiders in an area that was often at war.